CrossFit Level 1 Certificate Courses: CrossFit North Atlanta, Reebok CrossFit One, LaLanne Fitness CrossFit, CrossFit Pittsburgh, CrossFit SoCal, CrossFit Mayhem, CrossFit Laval, CrossFit B23, CrossFit Central London, CrossFit STHLM (Stockholm), CrossFit Oslo, Reebok CrossFit Officine, RIG CrossFit, CrossFit Pinheiros. CrossFit Level 2 Certificate Courses: CrossFit X-Factor, CrossFit TNT, CrossFit Basel, Fuerza CrossFit. 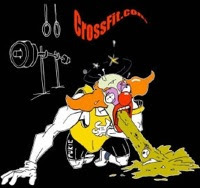 CrossFit Competitor Course: Max Oxygen CrossFit. CrossFit Kids Trainer Course: CrossFit King of Prussia.